Flaky Like a Warm Biscuit | Small, but valuable. I like to think that I’m usually pretty dependable. Ask me to bring you warm soup when you’re sick, and I’ll be there as quickly as possible. Plan to hang out with me, and I’ll be there more or less on time. But sometimes my inner flake refuses to be squashed (or the directionally challenged part of me that gets in the way of timeliness). You know how life gets. You’ve filled your planner so full that there’s more ink on the page than white space, and you’re not quite sure when your next empty waking hour will be. The idea of so many planned activities might fill your heart with glee, but it makes mine start jumping nervously. I thrive when there are chunks of time here and there that haven’t been earmarked for anything. Those blocks of time are a very important factor in keeping the planned activities moving along smoothly. The unplanned time is when things like cooking, doing laundry, playing with my dog, or even a few hours of blissfully doing nothing take place. All of those things help me feel like life isn’t spinning out of control. Unfortunately, the upcoming week is looking light on the unplanned chunks of time. I think there are a total of 4 unclaimed hours in the next 96. Really, an hour a day isn’t much time to keep life in order. I’m pitifully low on clean clothes and might even resort to the always classy swimsuit-bottom-as-underwear trick in the near future. All of this to say that I’m primed for a bout of flakiness. My typically dependable self flies out the window when time gets over-scheduled. I miss Bible studies, don’t hang out with friends as planned, and generally try to carve out some extra time at home in any way possible. And even though the flakiness keeps me from going insane, it really makes me upset that I can’t follow through on the things I’ve promised to do. 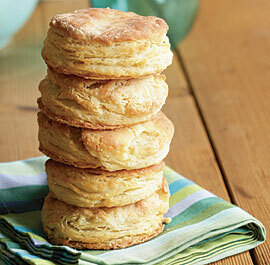 I’m hoping that the mere confession of my warm biscuit center will prevent me from crumbling this week. I’ll just eat ramen and be glad that I have a wonderful roommate to take care of my dog’s emotional needs for the next few days. Maybe in the meantime I can create a new type of biscuit that has a hard candy coating to protect its gooey inside. It would obviously be a cinnamon-flavored candy coating.